I did something I haven't done since high school--back in the Dark Ages. LOL I wrote a short story. 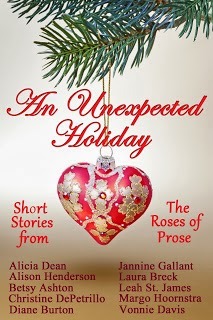 It is part of an anthology by The Roses of Prose authors called An Unexpected Holiday. We all started our stories with the same sentence: This was the last place she/I ever expected to spend Christmas. The story concluded on Sunday. I hope you enjoy Christmas in Space and the stories by the other authors as well.